A former intelligence officer who now owns a consumer drone company fears it’s a matter of time before ordinary, increasingly common drones become a weaponized threat to the public unless the federal government acts fast. He knows how consumers are modifying them to work beyond their intended capabilities, potentially making them lethal. In an article for Defense One, Brett Velicovich, former a military intelligence analyst with 1st Special Forces Operational Detachment-Delta, describes how the consumer drones he sells can become a weapon. In less than 30 seconds, one of them can fly thousands of feet in altitude without anyone seeing it. The range extender allows him to control it from seven miles away. Velicovich said he can also add a tracking device that will allow it to follow a vehicle or a person for the purposes of dropping a payload less than three pounds on the target. The problem isn’t getting any better and the government needs help. According to late-2016 research from the company Intel Center, terrorist use of drones in combat zones was growing at a substantial rate. The cost of the technology is dropping dramatically. The government spends hundreds of millions on defense contracting companies to make military drones safer; now it’s time to spend money on the consumer side before it’s too late. Everyone should be concerned. With the right technical knowledge, all a would-be terrorist has to do to make their drone into a killing machine is to go to Walmart or the Apple Store. U.S. officials are, indeed, concerned with the prospect of ISIS or some other terrorist group using drones. Officials from U.S. Central Command told Fox News in April that coalition troops face off against inexpensive drones at least 30 times a week, ones that are modified to carry grenades and watch troop movements. Earlier this year, U.S. troops have destroyed a drone factory and four storage facilities that house them. In a war situation, it is likely much easier to ID terrorists’ movements to and from drone locations, but how do you monitor (or, for that matter, ID) a terrorist going to Walmart to buy a drone in New Jersey? The good news is that commercial drones are not remotely as lethal as U.S. military-grade drones such as the MQ-1 Predator or the MQ-9 Reaper, which can carry missiles and travel 135 mph and more than 300 mph respectively. Store-bought drones, comparatively, are slow, easy to shoot down and can only carry a small payload that likely will cause minimal damage to a competent military. But what about civilians? As Newsweek notes, drones could be used to spray a deadly chemical on crops, or they could be deployed in swarms in cities to attack crowds. It seems unlikely to result in massive casualties, but it could leave a powerful psychological blow amongst the general population. In Israel, for example, Hezbollah has attempted to use drones against the public and the military. And during the Lebanon War, in 2006, Hezbollah flew three small Ababil drones into Israel carrying 40-50 kilo payloads each to hit several key targets before being shot down by Israeli F-16s. 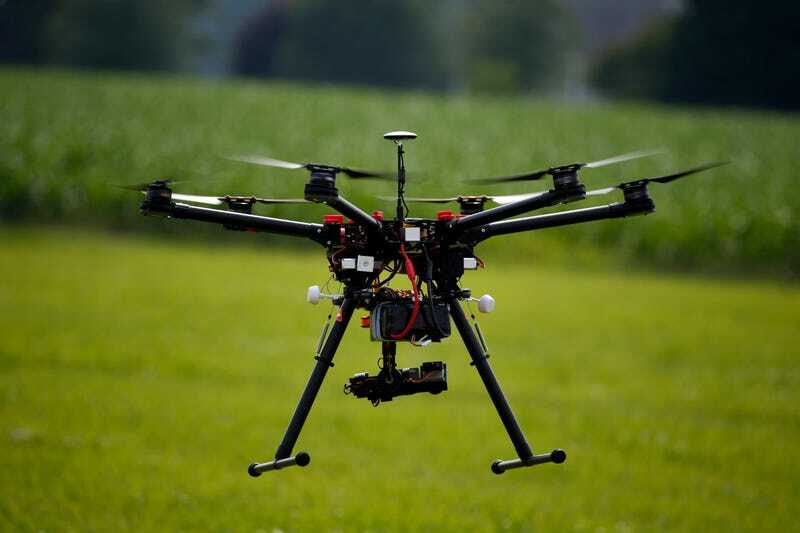 To prepare for increasing concerns of drone terrorism here in the U.S., Federal Aviation Administration and other agencies are testing technologies that have the capacity to shoot rubber bullets at rogue drones and specialized radars and radio-frequency monitoring devices to track them. So far, we haven’t experienced a drone attack here in the U.S. But knowing that a device designed for recreational use can be used to terrorize the public should have us all concerned.